A previous blog post on the subject of homosexuality quoted a number of passages of Scripture that describe God’s thoughts about homosexual activity; He calls it “detestable”, an “abomination”. I tried to give an explanation why God considers this behavior so offensive. The human race is to image God, and it’s in the relation between two genders (marriage) that man and woman can give accurate reflection to God’s relation with His partner-by-covenant. Homosexual activity sends the message that God and man are essential identical in the covenant relation He established with people. That’s a signal eternal God does not tolerate. Hence His strong words of condemnation concerning this ‘alternate lifestyle’. There’s a strong push in our society to make any condemnation of homosexual behavior unlawful. We’re told we need to accept the other’s choice to live as he/she wishes. We experience that this changing reality puts uncomfortable pressure on the Christian who takes seriously God’s evaluation of homosexuality. How would God have us relate to the openly gay workmate or classmate? Is it our duty to make him or her feel ‘detestable’? It seems to me that we need to answer the question on two levels. But I need first, I think, to set the stage. The fall into sin has broken every person on planet Earth today. As no two vases break in the identical way, so the brokenness resulting from our fall looks different in each of us. For the one the brokenness feels and perhaps looks like being short-tempered, for another the brokenness feels and perhaps looks like greed, and for a third the brokenness feels and perhaps looks like homosexuality. Because we are responsible for our own fall into sin, we are also ultimately responsible for the particular way in which we are broken. If my brokenness expresses itself in a very short fuse, I could perhaps excuse my flying-off-the-handle with the argument that that’s how I am (and perhaps even point to how my parents were) – but before God that stance obviously doesn’t cut it. The same is true in relation to homosexuality. There may or may not be circumstances that contributed to one’s homosexual inclinations, but before God that’s neither here nor there. More important than how or how come we’re broken is the question of what we do with our brokenness. And that brings us to what we’re to say to the gay neighbor. God’s people are, of course, to speak in agreement with the Lord’s own thoughts. As He is abundantly clear on His evaluation of homosexuality, the child of God may not convey a different signal. Homosexual activity is simply sin in God’s eyes, for which repentance is required. The manner in which this message is conveyed to people around us, though, may not be one of righteous condescension. The fact of the matter is that God hates every sin. To single out homosexual activity as more deserving of God’s judgment than adultery and fornication is simply unbiblical. In fact, the Lord God has no tolerance for greed – and if there’s any sin we Christians have embraced as fully as those around us, surely it’s the love of money. My point is that as we address another (in word and conduct) on the sins we see in his life, we need to communicate that we are battling within ourselves against our own pet sins. And to succeed in doing that we shall need to battle seriously against our sins – so much so that the neighbor we’re speaking with (be he a homosexual or an alcoholic or a sloth or whatever sin he’s guilty of) can sense the earnestness with which we take this battle. We do well, then, to learn to put David’s words honestly on our own lips: “I confess my iniquity; I am sorry for my sin” (Ps 38:18) – and do so genuinely. The same is true of Paul’s “wretched man that I am!” (Romans 7:24). As long as we don’t do so, as long as we don’t take seriously that we provoke God’s anger through our sins just as much as the homosexual next door, as long as we do not obviously loathe ourselves on account of that anger, that feeling of jealousy, that self-pity, we leave ourselves wide open to being seen as self-righteous and holier-than-thou. In fact, I wonder to what extent this smugness on the part of North America’s Christians contributes to the contempt our society has developed against Christianity. Our sins may be more ‘respectable’ in our cultured opinion, but that doesn’t make it so in God’s eyes – and it certainly doesn’t make it so in the eyes of those whom we fault of other sins. Here is need for repentance of our hum-ho approach to our sins. Am I saying with this that we ought not to speak to the homosexual about his guilt before God? No, I’m not saying that! Given that before God I am no better than my neighbor, and yet the Lord has made me His in Jesus Christ, it’s my privilege to show similar mercy to my neighbor – whoever he may be. But I need to tackle the log in my own eye first – now. That brings me to the second level I mentioned earlier. I’d asked whether it was our duty to make the homosexual feel ‘detestable’, and said that we need to answer the question on two levels: Yes and no. The gospel of redemption in Jesus’ blood is not meant for decent people. The gospel of redemption in Jesus’ blood is not meant for decent people. Christ Jesus did not come into the world to save the righteous but the sinners (Mathew 9:13). Christ on the cross endured the worst possible agony –why?- because that sort of judgment is what all sins deserve. 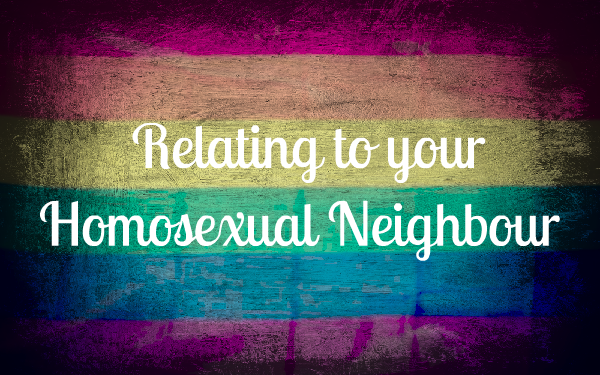 Both my self-pity and my neighbor’s homosexual activity alike caused Jesus’ hellish anguish. And Christ has triumphed, paid for my kind of sin as well as my neighbor’s kind of sin – so that there is forgiveness for all who embrace His sacrifice in faith. (1 Corinthians 1:23). That’s the good news that needs to calm our thoughts as we reflect on our own wretchedness, and that source of calm is equally what we need to keeping setting before the neighbor for his benefit. Yet conveying that message of peace through our words isn’t enough. The neighbor, caught as he is in his sin, also needs to experience from our attitude and conduct that we are truly thankful for the forgiveness the Lord has given us. My point: the sinner will see through the sugarcoated religiosity that speaks of the Lord’s forgiveness but does not ooze genuine relief at being forgiven. And relief, of course, flows from a sense of true guilt and looks like an honest and real fight against remaining weaknesses…. And so we’re back to the point I tried to make earlier.